The Landmark London hotel, a five star luxurious hotel, has to be one of the most beautiful hotels in London – it is like a slice of paradise in Marylebone! Located so close to major tourist attractions, you would not even think it when you are inside as it is an oasis of calm. When I walked through the red brick facade and saw the gorgeous Winter Garden, set in the hotel’s glass roofed atrium, it took my breath away, with its towering palm trees and natural light. I felt like I had left the crazy streets outside and entered into a tranquil hideaway. I absolutely adore palm trees and I totally forgot for that afternoon, that I was even in London, aside from enjoying a quintessential British tradition! It was the most perfect setting for Afternoon Tea, made even more magical with melodies from a Pianist adding to the ambience of the already stunning venue. A Harpist took over later, which was equally as fabulous. Starting off with a glass of Champagne De Castelnau each, we took in our surroundings, and marvelled at just how beautiful it all was, with the stunning high ceilings in the atrium and the ample sunlight – so perfect on a beautiful day. 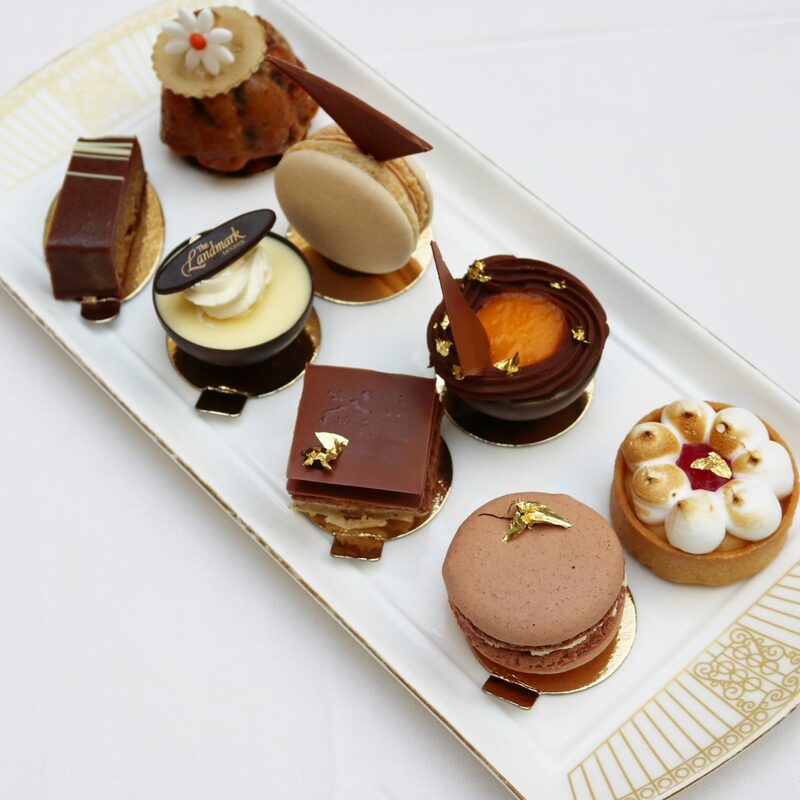 There are two options available for the Afternoon Tea – the Winter Garden Afternoon Tea and the Chocolate Afternoon Tea. The best part was you could have one of each, which we certainly did as we were having a tough time choosing between the two as they both sounded incredible. For our tea selection, I went for the Midsummer Mango, which has real mango pieces and golden sunflower blossoms in it and is blended with China and Ceylon black tea. Amit picked the Finest Darjeeling, which was a superior single estate Second Flush Darjeeling. Both our teas were really lovely, and were re-filled regularly. The assortment of finger sandwiches were the first to arrive, and we had a fabulous selection of Organic egg mayonnaise and mustard cress, Coronation chicken on walnut bread and Classic cucumber to enjoy. You also get Lapsang Souchong smoked Scottish salmon as part of the selection normally but due to our dietary requirements we swapped this for an extra Coronation chicken. The best part was that the sandwiches were also getting replenished if you wanted more of a particular one, which was my husband’s favourite part of the Afternoon Tea, and he immediately said it was such a lovely gesture, and not one you experience at other Afternoon Teas. When the scones, accompanied with clotted cream and strawberry and cherry jam (you can choose what jam you want), and the sweet selection of cakes and pastries arrived, we were speechless. The scones were a selection of warm freshly baked chocolate chip, raisin and apple and fruit peel scones, and amongst some of the loveliest we have had. Baked to perfection. Everything was superb and the attention to detail was seriously impressive! From the Winter Garden selection, there was a Milk chocolate dacquoise sponge with hazelnut Chantilly cream, a glazed lemon curd meringue Breton sablé biscuit, a Macaroon with vanilla custard and poached rhubarb and a Redcurrant and almond Bakewell topped with stem ginger and cream cheese icing. The Chocolate selection had a Coconut and chocolate macaroon, a Banana, pecan nut and milk chocolate cake, Blood orange and white chocolate mousse and a Milk chocolate dacquoise sponge with hazelnut Chantilly cream. It is safe to say we felt pretty spoilt at this point and were so excited to try them all! They were all so delicious and intricately created, and the flavours were absolutely scrumptious. I can totally understand why this is an award winning tea and it is absolutely deserving of the accolades it has as it is truly remarkable..
We had such a lovely experience, and it was the perfect place to enjoy an Afternoon Tea with loved ones. I will definitely be back as it was brilliant, from the moment we arrived, throughout, and even at the end. You are able to take home any pastries that you are unable to finish to enjoy later too in a stylish box, which is also such a terrific gesture as I can guarantee you will be regretting not doing so if you leave any behind! Afternoon Tea is available from Monday – Friday 3pm – 5pm and Saturday – Sunday 1:30 pm- 5:30pm. My Afternoon Tea experience was complimentary but all views and photos are my own. This afternoon tea looks absolutely divine Binny! I think my favourite would have been the banana pecan nut cake. Beautiful photography as always. What a fantastic afternoon tea! It would have to have been the chocolate one for me! What a perfect afternoon tea!